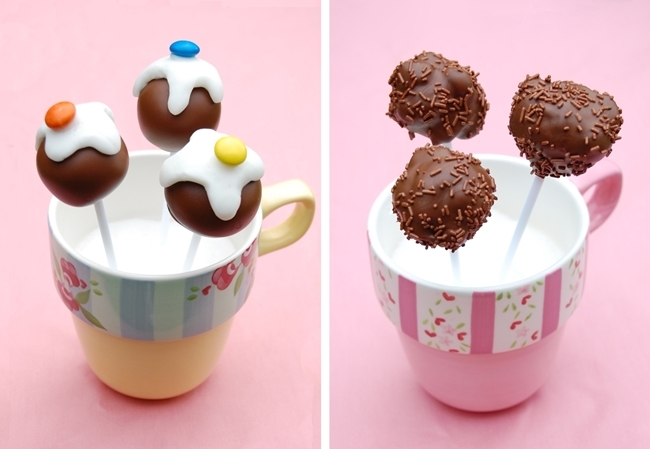 I have always wanted to have a go at making cake pops but I never got round to it. But when I found out that the class I work with were making them, it gave me a perfect excuse to give them a trial run! As the class will be making them to sell for charity, I thought it would be nice for them to try one. I wanted to share them with you because they look so cute and, according to the staff and children, they are delicious. They are perfect for parties and just when you want a little treat. One of the pupils said that the cake pop, in the picture on the right, looks like a Christmas pudding! 1. Line a baking tray with baking paper. Crumble the sponge cake into a mixing bowl. Add the mascarpone cheese, icing sugar and vanilla and mix together until you have a thick paste. 2. Roll a 25g/1oz piece of the paste into a ball. Shape the remaining cake pops in the same way. Place on the baking tray and chill in the refrigerator for 1-2 hours to firm up. 3. Put the chocolate in a heatproof bowl, set the bowl over a saucepan of gently simmering water and heat until melted. Remove from the heat. Push a lolly stick into each cake pop. Dip a cake pop into the chocolate, turning it until coated. Lift it from the bowl, letting the excess drip back into the bowl, then place it in a cup or tumbler. I put sugar in the cups to stand them in. Repeat with the remaining cake pops. Chill or leave in a cool place until the chocolate has set. 4. Put the fondant icing sugar in a mixing bowl and beat in the water until smooth. Spoon a little onto a cake pop, easing it slightly down the sides with a teaspoon. (I used ready made fondant icing for the ones in the picture.) Before the icing sets, put a small sweet in the centre of each cake pop. 1. Line a baking tray with greaseproof paper. Put the plain chocolate in a heatproof bowl, set the bowl over a saucepan of gently simmering water and heat until melted. Stir in the butter. Leave until the mixture is cool but not beginning to set. 2. Put the sweets in a polythene bag and tap firmly with a rolling pin until they are broken into pieces. Finely chop 150g/5.5oz of the milk chocolate, then stir it into the melted plain chocolate with the sweets and marshmallows until thoroughly mixed. 3. As soon as the mixture is firm enough to hold its shape, roll 20g/3/4oz of it into a ball. Shape the remaining cake pops in the same way. Place them on the baking tray and chill for 30-60 minutes, until firm but not brittle. Push a lolly stick into each cake pop, then chill for 10 minutes. 4. Roughly chop the remaining milk chocolate and melt as above, then remove from the heat. Dip a cake pop into the chocolate, turning it until coated. Lift it from the bowl, letting the excess drip back into the bowl, and place it in a cup or tumbler. Sprinkle with chocolate sprinkles. Repeat with the remaining cake pops. Chill or leave in a cool place until the chocolate has set. Believe me, once you start eating one, you will definitely want another! Ahhh...they are too so pretty. You did a fantastic job! These look so cute! I will take 2 please. Mmmmmm. I love cake pops! Please send some my way! Okay I seriously needed this lesson last weekend... I paid WAY too much for some custom cake pops for the baby shower I threw, and now I see they're actually not that hard to make!